This entry was posted in Food, Recipes and tagged banana, half marathon, race, runner, running, smoothie. Bookmark the permalink. Good luck. I’ve started jogging in the past few months. This would go down very well! Perfect ! You’ve made an Elvis sandwich in a glass , and without the bacon which always seemed uneccesary . This should have you ready to run an extra marathon tomorrow ! I’m full of admiration and wish you a fun day’s running . I am SURE you knocked ’em dead today. Woohoo! And, you ran 13 miles; that’s nothing to push off as any small dead. You rock! If I ever managed to run thirteen miles in one go I would have no problem telling anyone who would listen what an excellent runner I was. Good luck. Honey, I think if you are running 13 miles at a whack, you are a proper runner! You are no imposter!! I love smoothies for breakfast. My usual is plain yogurt, orange juice, banana, blueberries or whatever I have on hand, and a Tbsp of ground flaxseed. I am going to have to try this one. I love peanut butter and banana sandwiches and your recipe would save me the bread calories! Hope you did well on your run!! I forgot to add that I am on a cholesterol lowering diet (super boring!) for a while and I’m not a big fan of oatmeal. Your smoothie recipe is a great way to add it to my diet. I never thought of adding oatmeal to a smoothie. Thanks!! That looks very good indeed. I might have to put some jogging trousers on and pretend that’s why I’m drinking it. But, to paraphrase Lawrence Block ‘I occasionally think that jogging might be good for me. I take 2 aspirin and lie down in a darkened room until the feeling passes’. So I can’t imagine what 13 miles feels like. Full of admiration for you tho and I’m sure you fit the criteria of a ‘real runner’ perfectly. This looks really great! 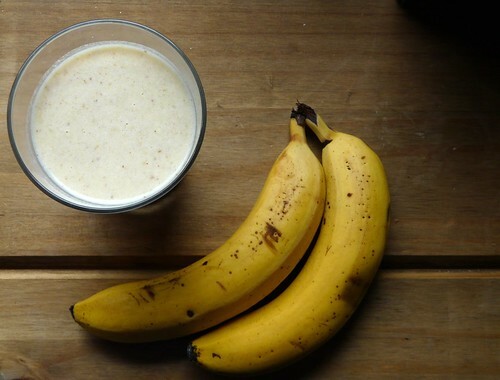 I love nut butter and banana smoothies! I have just discovered Your blog and the amazing recipe for this smoothie 🙂 I just want to ask what kind of peanut butter You add? Sweet or salty? wish I could subscribe via email.